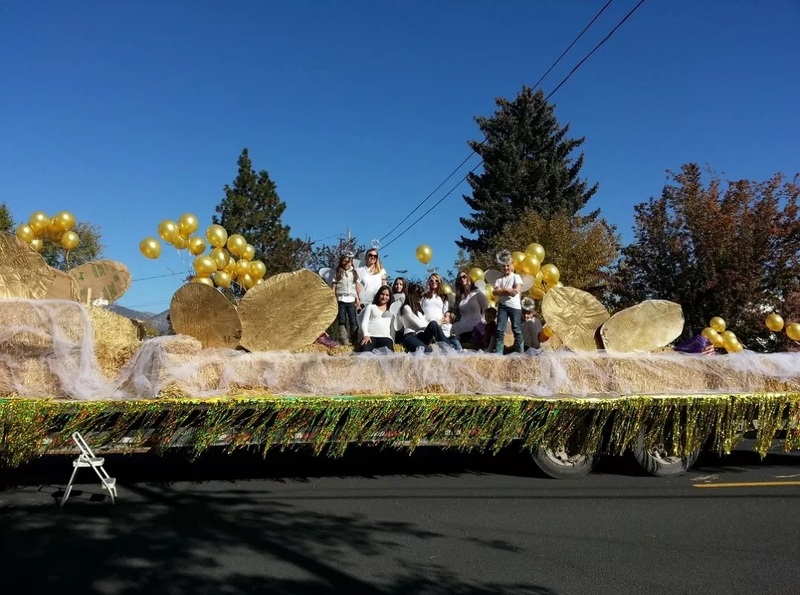 Our epic, award-winning Klamath Basin Potato Festival float from 2013! 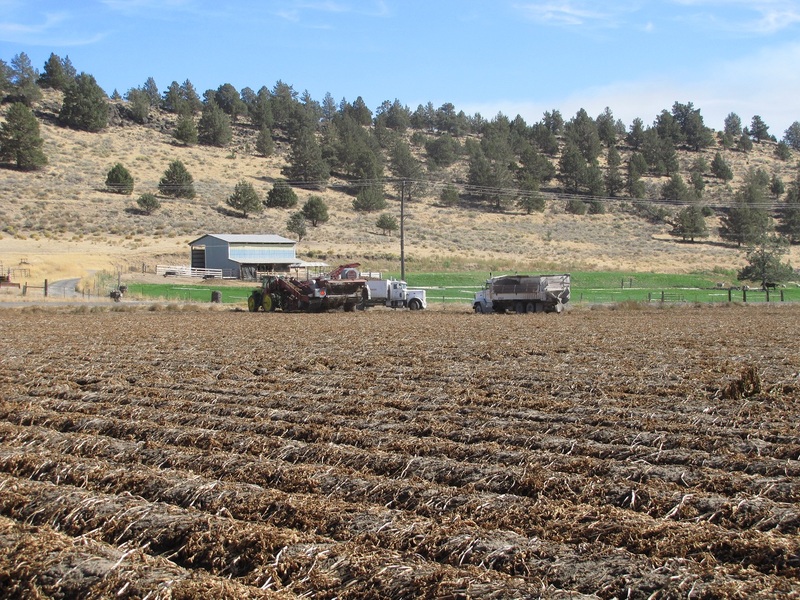 For us, it’s hard to think about potato harvest without the Klamath Basin Potato Festival being mentioned. In our last post about potato harvest, we mentioned the Potato Festival in a list of other activities going on during harvest. 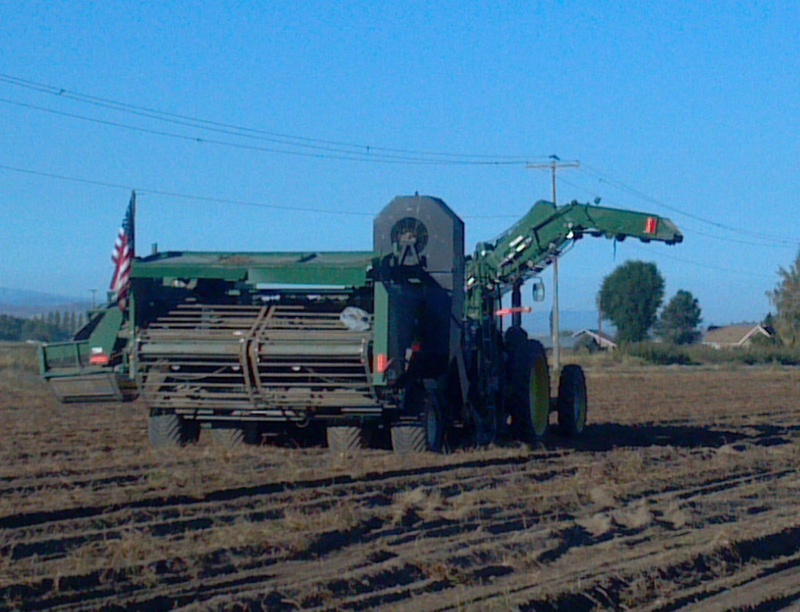 However, if you look through our Farm Blog, you’ll see we’ve been participating in the Spud Festival for years. Obviously, our history with the Potato Festival goes back before that. Years and years ago, before we moved into our processing plant in Malin and weren’t farming as many acres, Jan would gather and clean the potatoes entered for the Spud Festival. Parade time would find the Walker family gathered at the home of Glenna Walker, aka Grammie, aka Bill and John’s mom. The kids would gather candy thrown from the floats while Glenna hosted family, friends and neighbors. Over the years, things changed and new traditions developed. Our companies started getting more involved with the Spud Festival and creating new rituals. For a few years, we put together floats and tossed candy and bags of potato chips to the crowds, hoping to take home the bragging rights for the best float while the chipping potatoes hand selected by our agronomy team earned ribbons in the potato judging. The office staff started a potato lunch potluck where everybody brings something different to top off baked potatoes with. Between the camaraderie and community involvement, it created an opportunity for fun during a crazy time of year. Our traditions have changed again, and in a way have come full circle. The huge floats of years past have gone to the wayside for now as the trucks are needed on the road and our staff is busy. The office potato potluck still lives on, and instead of our agronomy team entering the potatoes for judging, our employees’ kids entered them this year. Still wanting to be involved with the parade and the community, last year we started a new tradition that will likely carry forward. 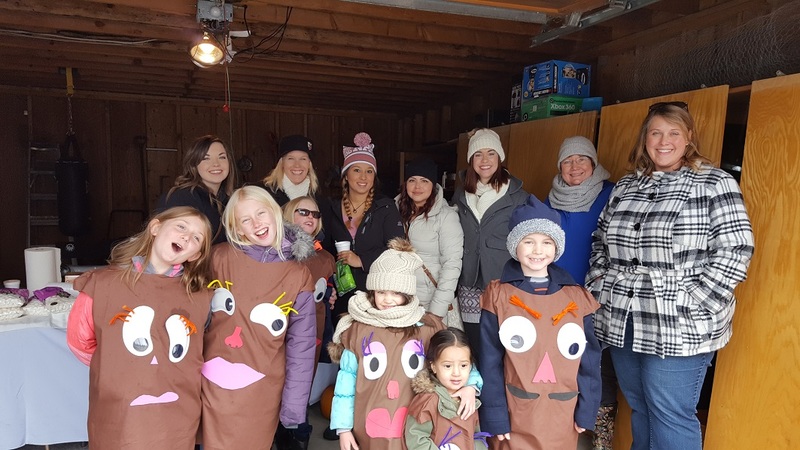 From Grammie’s garage, just across the street from the Merrill Civic Center, our office team handed out hot drinks and potato chips to friends, family and anyone else who came to Merrill to watch the parade. Suzanne getting in on the potato feast goodness! As you can see by Tricia’s spud, with broccoli added potatoes make a healthy, delicious lunch! The biggest spud at the 2018 Potato Festival entered by Alli Villasenor! Here’s Leo Pena’s third place entry for largest potato! Here’s a nice collection of blue-ribbon chipping potatoes! 2017 was a bit wetter and colder when we handed out hot chocolate, cider and potato chips at the Potato Festival parade. Our office crew was ready to hand out drinks and snacks at the parade. Our office staff getting ready to watch the Spud Festival parade. 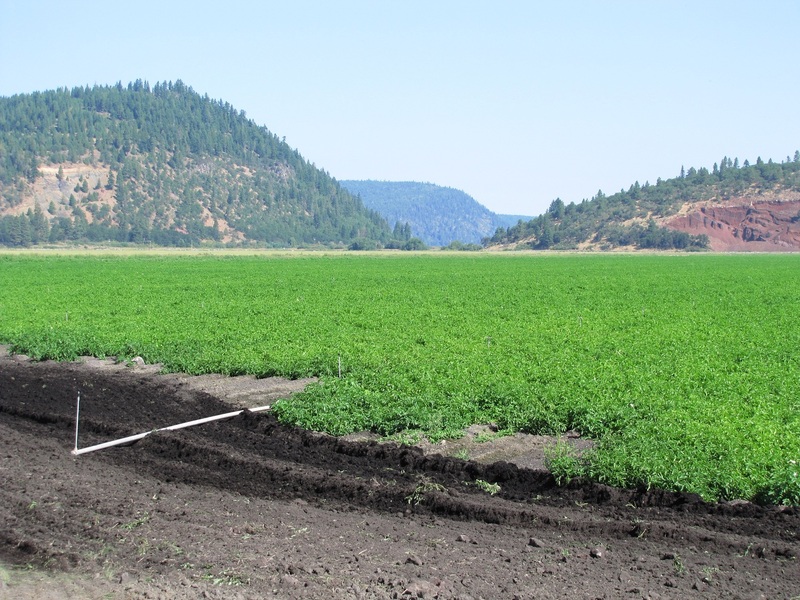 We’re proud to be a part of a community that celebrates ag the way the Klamath Basin Potato Festival does. We’re also proud to have a group of dedicated employees who help us carry participate in the community. Thank you to our staff who helped during the Spud Festival, and thank you to everyone who stopped by for a bag of chips and something to sip! Save for fall farming, the fields are mostly quiet again. The hay has been stacked in the barns, waiting to be sold and shipped and the granaries are full of wheat and barley. Chipping potatoes have been piled in our cellars while spud trucks run from the storages to the packing shed instead of from the fields to the storages. Another successful potato harvest is in the books! This year’s harvest began back in August. Considering we finished up shipping in July, our packing shed didn’t have much time to turn around and get ready for our annual Open House Field Day, let alone for shipping season to start again. 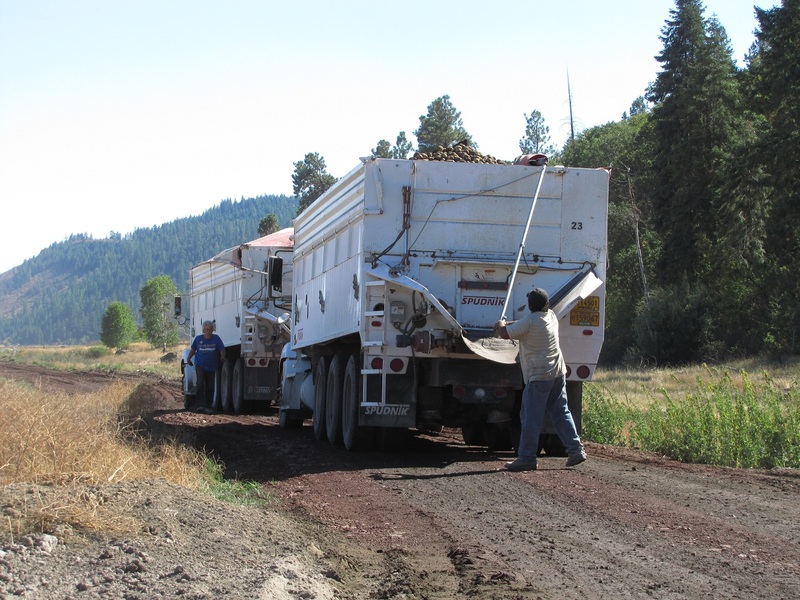 But, as we’ve mentioned in the past, we have amazing crews and some of the best employees in the Klamath Basin. Needless to say, they were able to get everything buttoned down and to start shipping! Here’s one of the guys responsible for getting our packing shed ready – Felimon Acosta. Before they’re washed, chipping potatoes are pre-sorted going into the packing shed. Another round of hand-sorting before our chipping potatoes are shipped! Sew ’em up and ship ’em! Before this potato field can be dug, the pipe needs to be pulled. 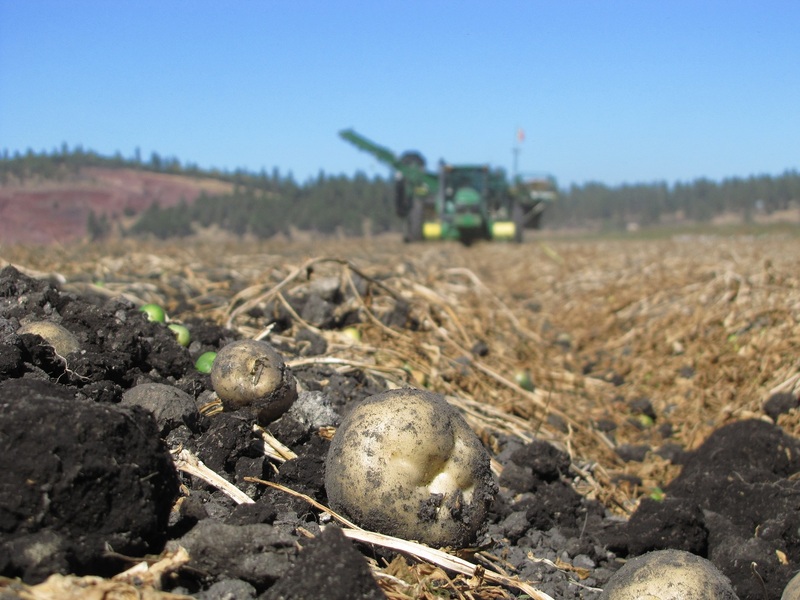 If we were to venture a guess of when our busiest season is, planting and spring farming might get quite a few votes, but it’s probably potato harvest. 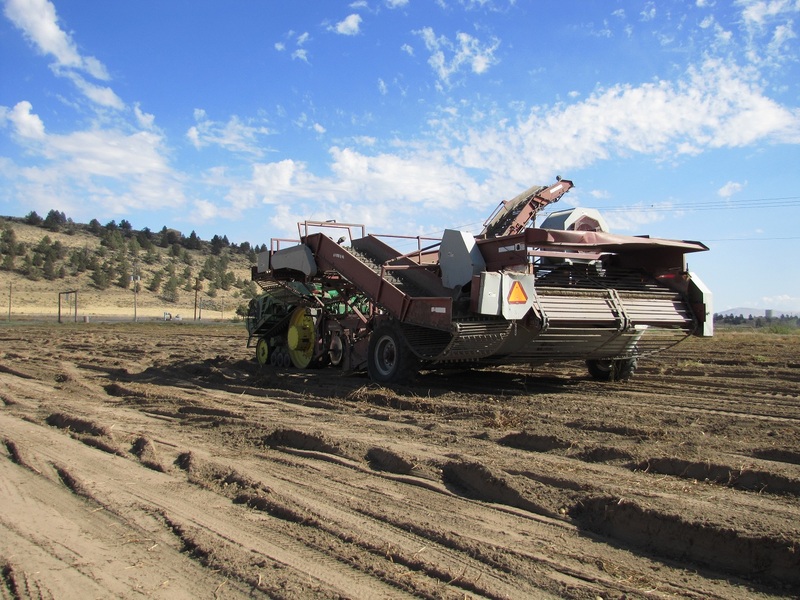 It takes a lot of work to get the fields ready for digging, let alone the fact we’re cutting grain, still cutting hay, firing up the processing plant and our offices are running at full tilt. 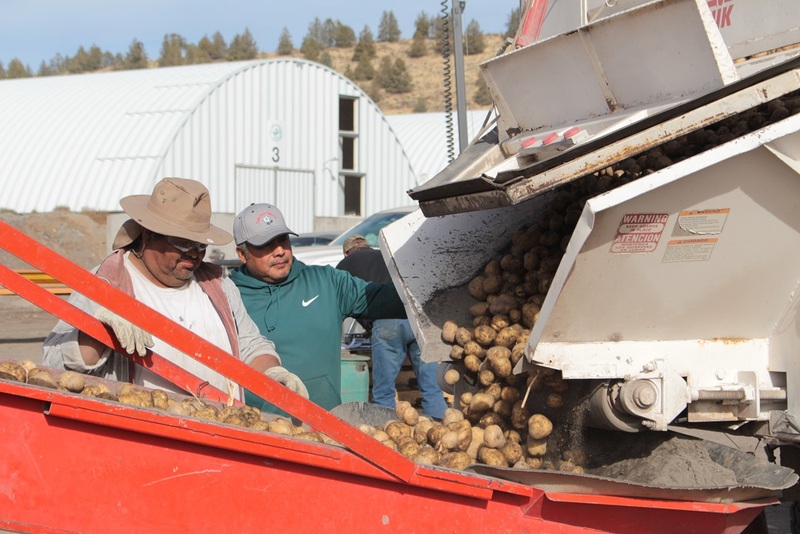 Then there’s all the community-related events, like the the Tulelake-Butte Valley Fair at the beginning of September and the Klamath Basin Potato Festival in October. We usually also welcome school tours to check out our shed and learn about agribusiness and how a farm operates. 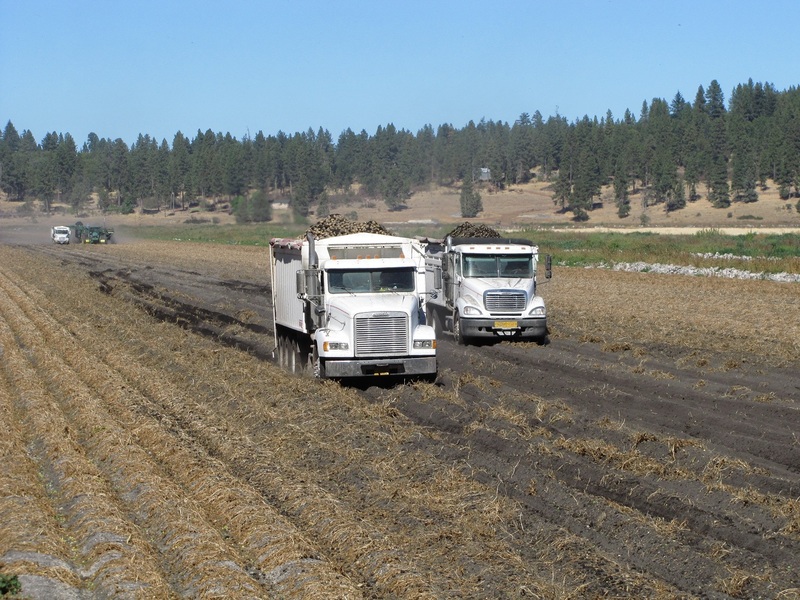 There’s a lot of action during potato harvest, and somehow our crews manage to keep everything rolling along. 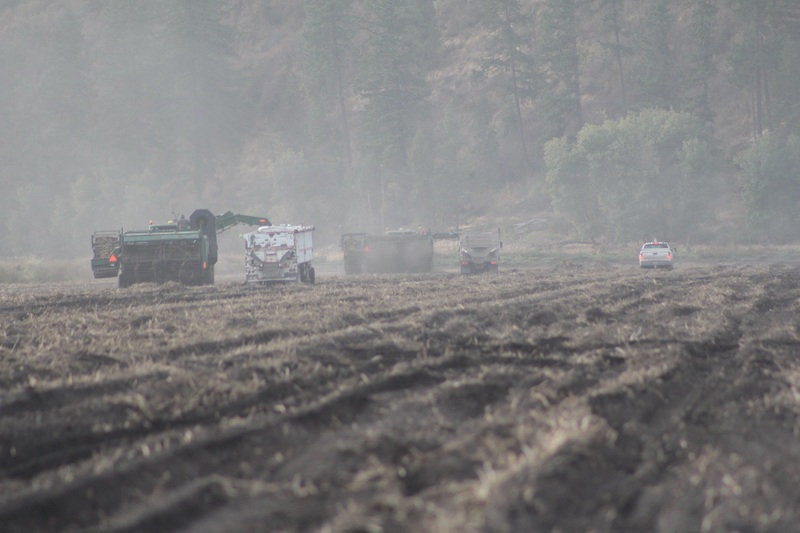 Speaking of our crews, we cannot thank them enough for their dedication and the hours they put in to make it another successful potato harvest. From the shed to our offices, from the tractors and trucks to the fields, we manage to get a great group of people together to help us make Gold Dust and Walker Farms a continuing success. It isn’t always easy, but with their help and dedication we make it through. Thank you to everyone who works for us, and for another great harvest! One of our growers, Kyle Patterson, unloading a load of chippers. A little fall farming just north of our cellars. Though the bulkers have been put to bed, it doesn’t mean we can’t still enjoy a few photos of them in action. 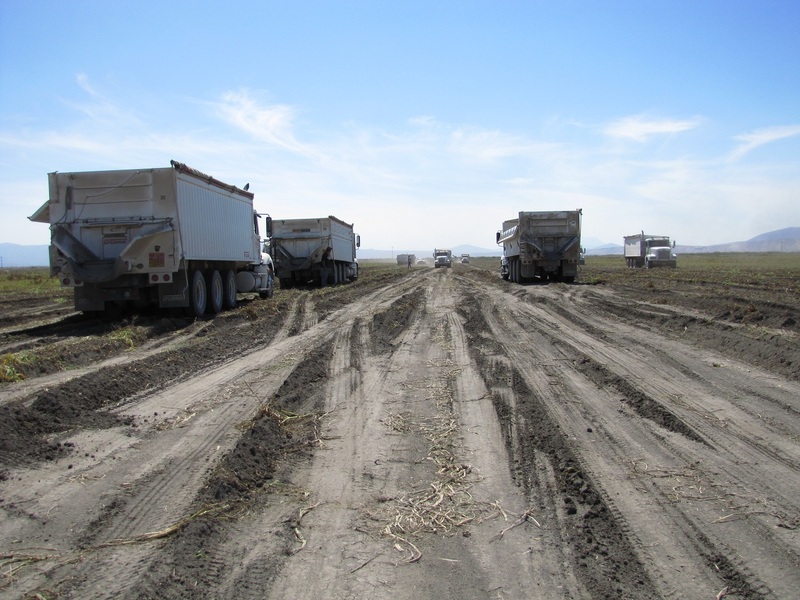 Below are some photos taken just below the Tule Lake leases in the shadow of Mt. 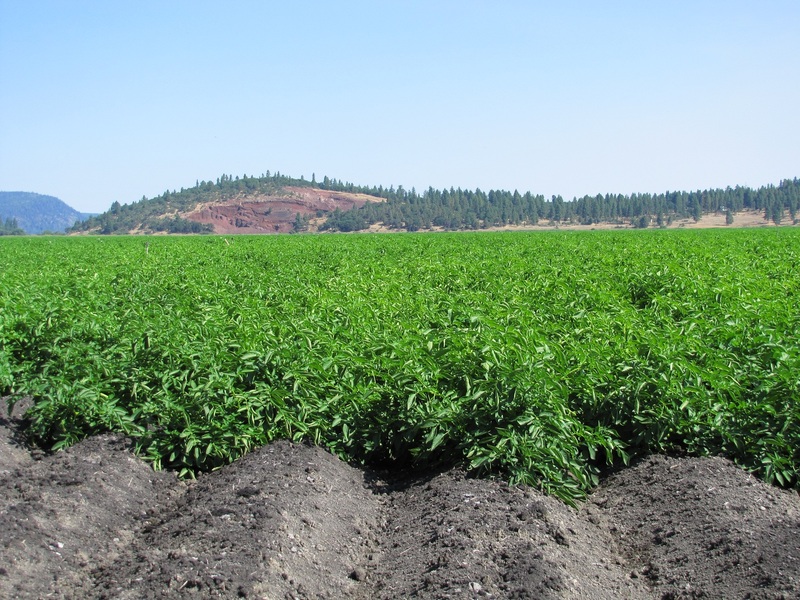 Shasta and from the Caledonia, located just Northwest of Klamath Falls by the Running Y Ranch. Waiting in a potato field. Two potato diggers fill a spud truck and a belt trailer. All aboard the potato harvest train! 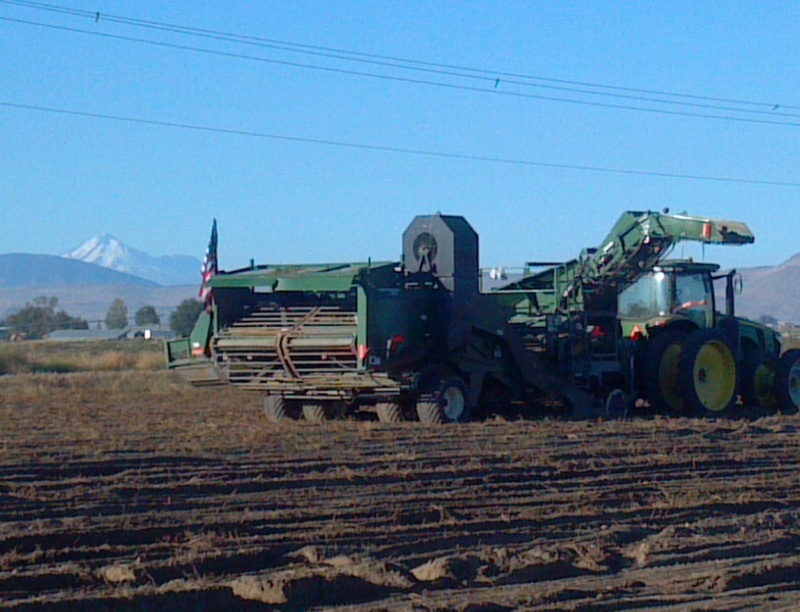 Mt Shasta makes a dramatic backdrop for this organic potato field. Filling a belt trailer with organic chipping potatoes. Heading to the last field on the Caledonia. 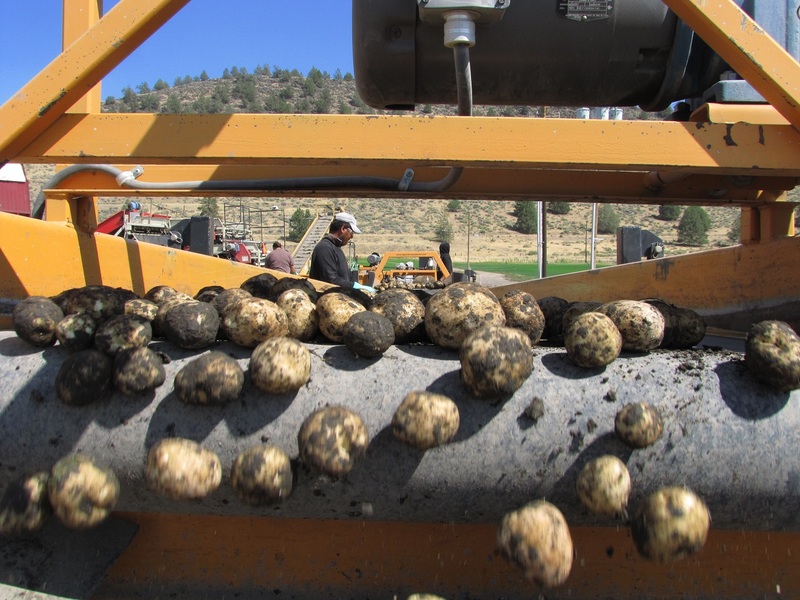 Loading a spud truck with chipping potato seed. It takes a lot of equipment to dig potatoes! That’s a lot of potato seed! Now that the belt trailer is full, it’s time to haul it home! Here’s to another successful harvest. Now bring on shipping season! Where Do Kettle Brand Chips Come From? Ask Tater Tracker! Ever wonder where the potatoes for your Kettle Brand Chips come from? As a chipping potato grower, we get to work with a lot of recognizable brand names from around world – and it’s pretty cool. People love to know where their food comes from, and as we attempted to answer the question “where do potato chips come from?” in another post, we’ve been given an opportunity to answer it again! Ever been snacking on Kettle Chips and ever wonder where they came from? Well, they’ve provided an online tool to give you the answer! Kettle Brand has released their Tater Tracker, which highlights their potato growers and the farms where the potatoes come from. 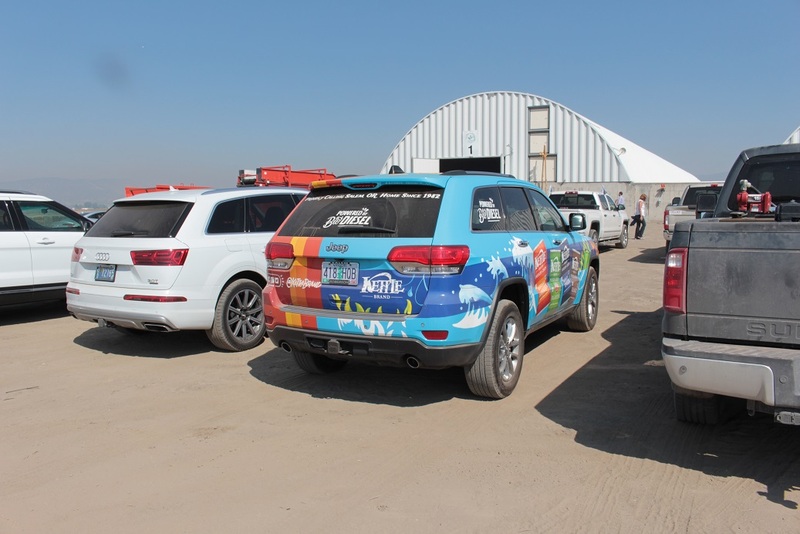 As you might recall from our Open House Field Day post – we’re one of those growers. And, yes, Gold Dust and Walker Farms is featured on Kettle Brands’ Tater Tracker page as well as a profile on Weston! So, how does the Tater Tracker work? 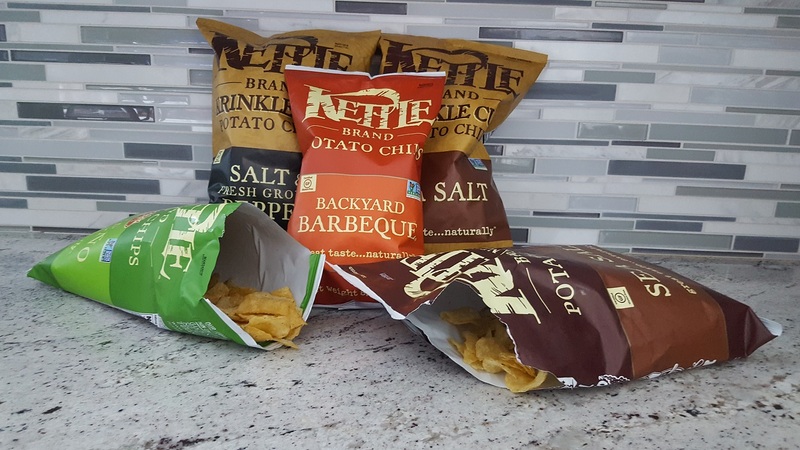 First, you obviously have to get a bag of delicious Kettle Brand potato chips (we recommend buying at least a dozen!). Next, locate the “Best Before” date located on the top right corner on one of the many bags you’ve purchased. Just below it you’ll find two numerical codes – type the second one into the space on the Tater Tracker page and you’ll see which Northwest potato farm your chips came from! Step 2: Locate the Tater Tracker code just below the “Best Before” date. Yes, the last four digits too. Step 3: Enter the entire code into the Kettle’s Tater Tracker. As you see, the last four digits are entered at the end. If you look at our grower profile, just under Weston’s bio you’ll see something else that Kettle has done with these pages – a virtual farm tour! While best viewed on an Android device, as the video plays you can turn your phone to get a 360 degree view of our potato farm, the sheds and even chipping potatoes being harvested. It’s a great way to see where your potato chips are coming from and give visitors an idea of what makes each of these potato farms unique. We love that Kettle Brand is as proud to work with us as we are with them. 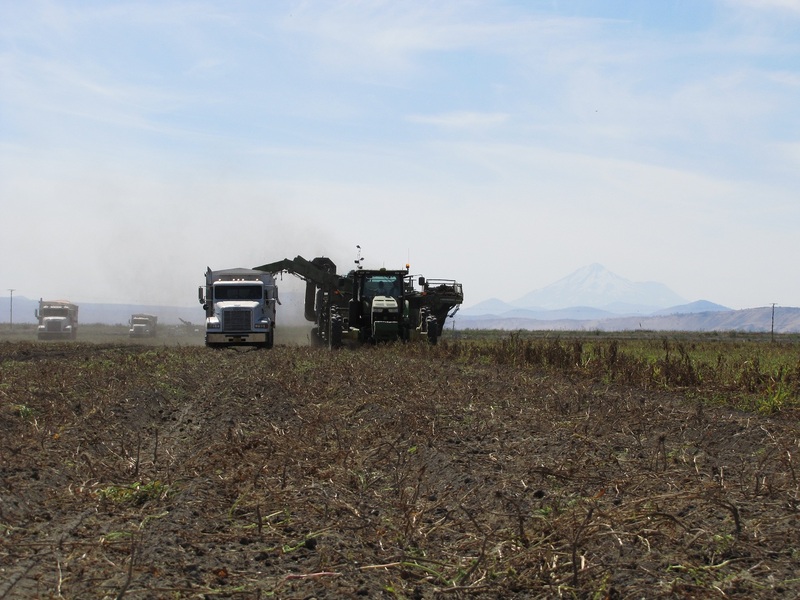 Not only does their dedication to sustainable agriculture match ours, it’s great to work with a snack company located in the Pacific Northwest that features local farms on its site. Thank you, Kettle Brand! About the time we feel like we’re getting our feet under us, we realize it’s almost the end of the year. What feels like a short few weeks ago actually turns out to be months, and we realize just how busy it’s been around Gold Dust and Walker Farms. While we constantly talk about how busy it is around our sheds and farm, the reality is that it is always busy! Regardless of the time of year, there’s always something going on. However, when summer turns into fall, and we’re in the midst of harvest, shipping, organizing labor and doing whatever it takes to get potatoes to our customers, our campus feels more like a beehive than a farm. 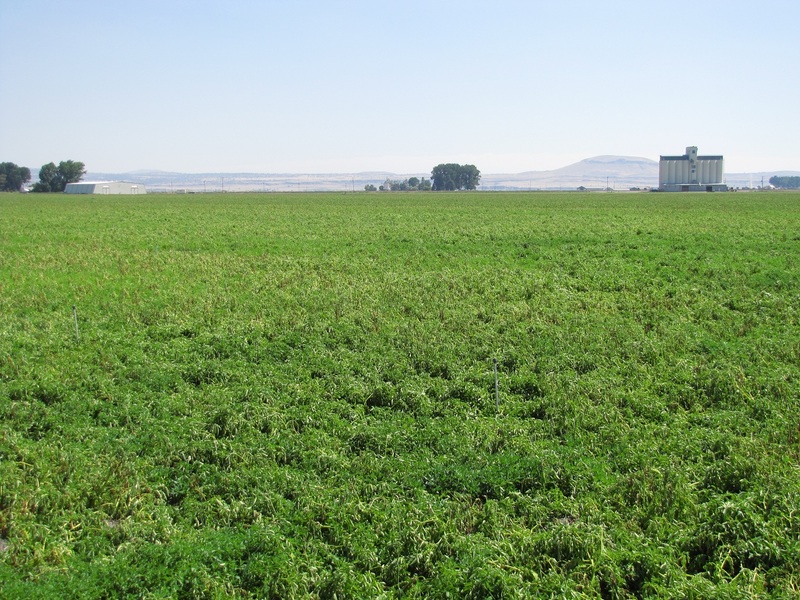 Look at all that dairy quality alfalfa! Looking back at this harvest, we started digging chipping potatoes on August 15th. 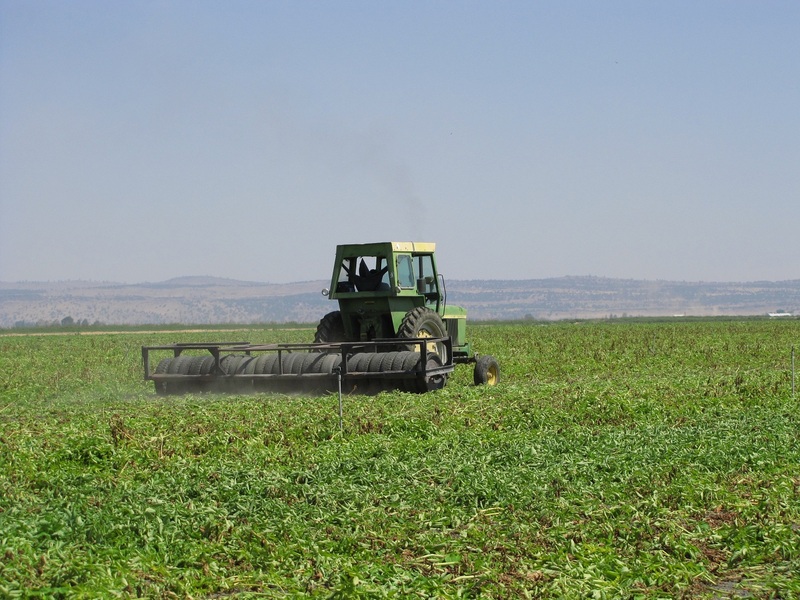 But potato harvest wasn’t the only thing going on in the fields – we were cutting alfalfa hay and grain. In the sheds, our crews were getting the potato processing plant ready for our annual Open House Field Day as well as shipping season, which started in August as well. As for the offices, our staff was coordinating loads, running expanded payrolls, recruiting labor, getting organized for the Open House Field Day and providing support to the farm and shed crews. And all of this is just the beginning of harvest! Sack ’em, sew ’em and ship ’em! As August rolled into September, potato harvest and grain harvest rolled on and we were getting our fourth cutting of hay. Our packing shed was running at full tilt, as were our offices. kids at the auction. 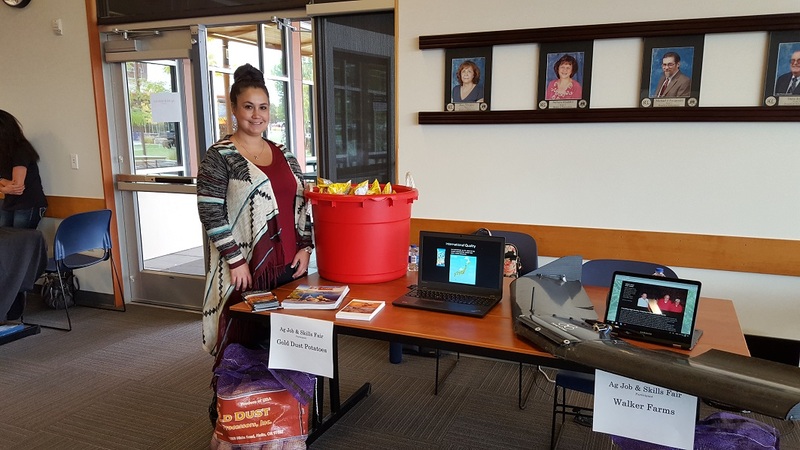 Speaking of fairs, we also participated in the first annual Ag Career Fair at Klamath Community College. All of that combined made for a busy September! The Gold Dust & Walker Farms Potato Festival Crew! When October arrived – you guessed – more potato harvest! With grain harvest over and our swathers and balers finally put away, it was now time to start fall farming. Meanwhile, back at the shed trucks lined up waiting to get loaded while our office staff started working on inventory, preparing for the Leadership Dinner and basically doing whatever it takes so we can keep farming and shipping potatoes. We also participated in the Klamath Basin Potato Festival in Merrill, and this year instead of being in the parade we handed out hot chocolate, hot apple cider and small bags of potato chips to anyone who braved the cold rain to watch the tractors, marching bands and floats make their way down the main drag. In years past we’ve had potato harvest wrapped up before the Potato Festival, but this year we weren’t out of the fields until the 25th. And now we’re deep into November. 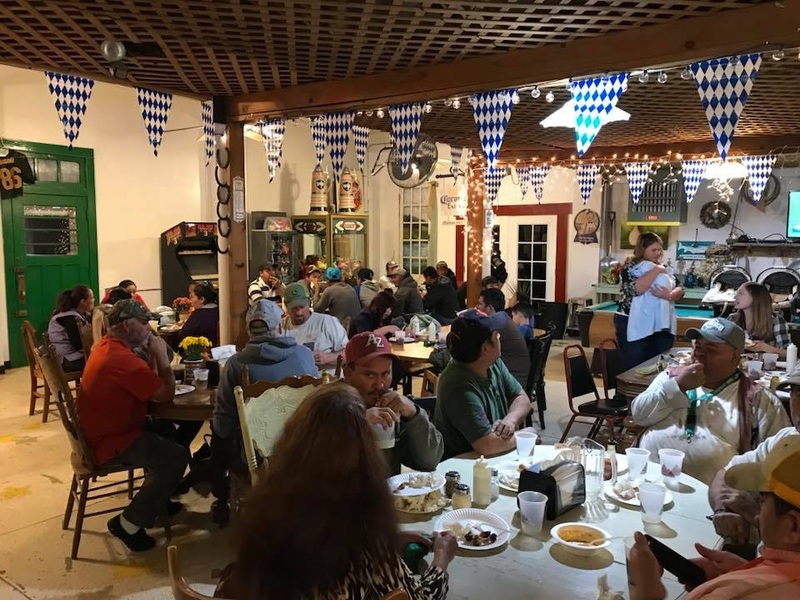 We just had our annual Leadership Dinner on the 10th which gave our partners an opportunity to share how our businesses have been doing and brainstorm with our employees with what can help Gold Dust and Walker Farms to continue succeeding. At the dinner we also recognized one of our long-term employees, Salvador Vera. Salvador has been with Gold Dust and Walker Farms for 20 years. In that 20 years, he has become an integral part of our businesses, helping with everything from laying out pipe in the spring to helping with harvest and keeping the shed running. As a thank you, Weston presented Salvador with a watch. Thank you for your dedication, Salvador! Looking back at the last four months, the thing that stands out to us isn’t how much we’ve accomplished or how busy it’s been. What stands out is how many people, working together, can get so much accomplished. Not only does it take an extraordinary number of people to keep our farm and shed running, it takes extraordinary people. We’ve been blessed with loyal, hard-working employees who work as a team. In the offices, the shed or out in the fields, our crews pull together everyday to help make Gold Dust and Walker Farms successful. Thank you, Salvador, and thank you Gold Dust and Walker Farms employees! With that said, thank you to everyone for putting in the dedication it takes to make us successful. As we’ve said before, the modern farm is more than just a guy on a tractor – it’s a small army of dedicated people in the office, fields, and in our case, packing sheds that make it so we can keep doing what we do. Thank you. Standing on the red-cinder road that runs the edges of the fields of the Running Y Ranch, you can feel the ground moving under your feet as though you’re standing on a hollow drum that someone has began slowly beating. The only grumble is from a passing potato truck, loaded down with chipping potatoes. It’s not a storm or an earthquake, but the rumble of harvest. If you talk to one of our lead hay-guys, Toby Turner, he’ll tell you harvest began for him back in June with the first cutting of alfalfa. 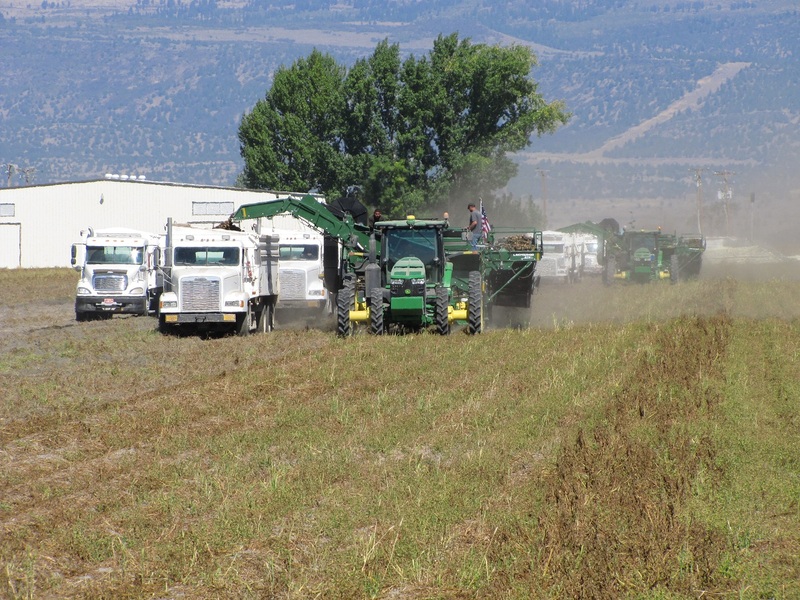 While the people in the swathers and bailers and hay trucks feel harvest is a summer-long endeavor, outside of the hay operations fall harvest has arrived in the Klamath Basin. The roads and highways are full of bulk beds hauling grain, potatoes, onions, garlic and many of the other crops grown here. Hay sheds, grain bins and potato cellars are getting fuller around Gold Dust while the fields are getting barer. While we worried what the drought would do to our part of the world, the long days of digging potatoes are proof that we’ve made it through another hard summer filled with stress over whether or not we’d have enough water to farm. Can you see what makes this combine different than our other harvester? Easy does it . . . . Yes, that is a lot of hay! 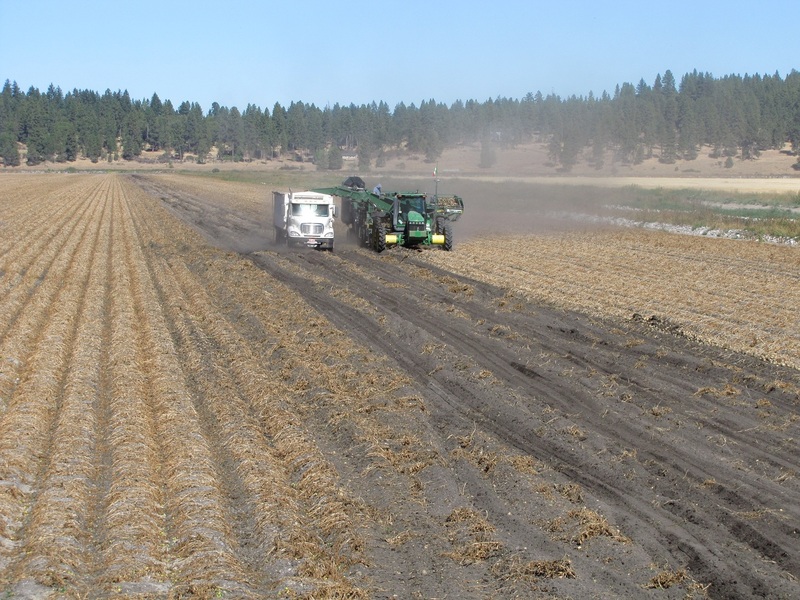 Gold Dust and Walker Brothers’ potato harvest kicked off on August 31st this year, making it one of the earliest times we’ve ever been in the fields. And by the time the first day of fall finally rolled around (September 23rd), we were cutting out last grain field, an organic rye field just outside of Malin. The rainy spring helped us make it through the summer, and the beautiful, sunny days of September have made grain and potato harvest nice. 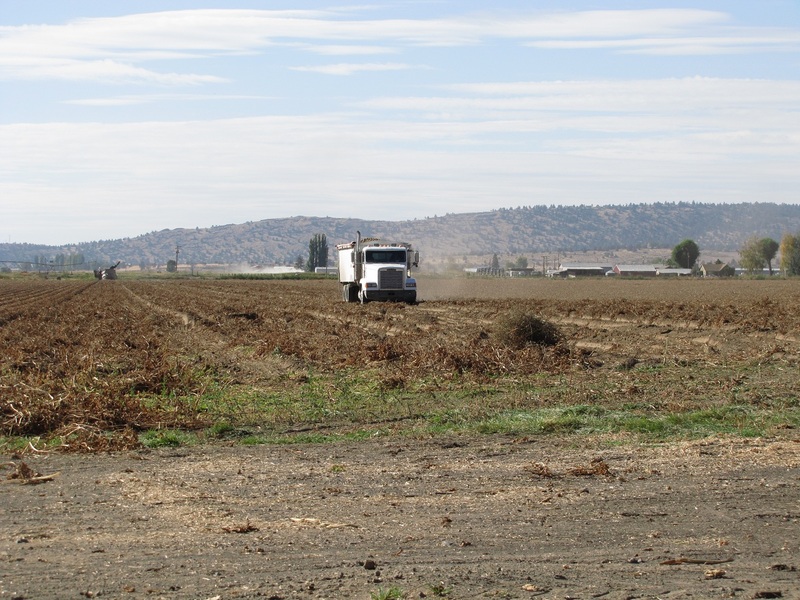 As long as we can keep our equipment running, our trucks on the road and everyone safe, there’s a good chance we’ll have potato harvest wrapped up the first full week of October, making it one of the earliest ends to potato harvest we’ve ever had. Before we get to more photos of harvest, please keep an eye out for all trucks on the road. Remember, these vehicles are loaded down with tons of crops, making it hard for them to stop quickly for cars that pull out in front of them. We try to make sure our drivers are safe, but they can only be as safe as the car in front or behind them. It’s dirty work prepping a potato field for digging. Loading a spud truck takes a bit of skill and patience. Yes, that’s a big load of chipping potatoes. And yes, it’s pushing a lot of dirt. With no trucks, our potato bulkers take a break. Time to unload the chipping potatoes! Rocks and dirt clods are sorted from our chipping potatoes before going into storage. From the Running Y Ranch into Cellar 2! Here’s to a great harvest! What a gorgeous day for harvesting potatoes! Just a little over a month ago, we announced the “official” beginning of the 2014 potato harvest. Now, just a little over a month later, we’re announcing it’s officially over. And what a spud harvest it has been! As we say every year, every harvest brings it’s own challenges and this one is no different. 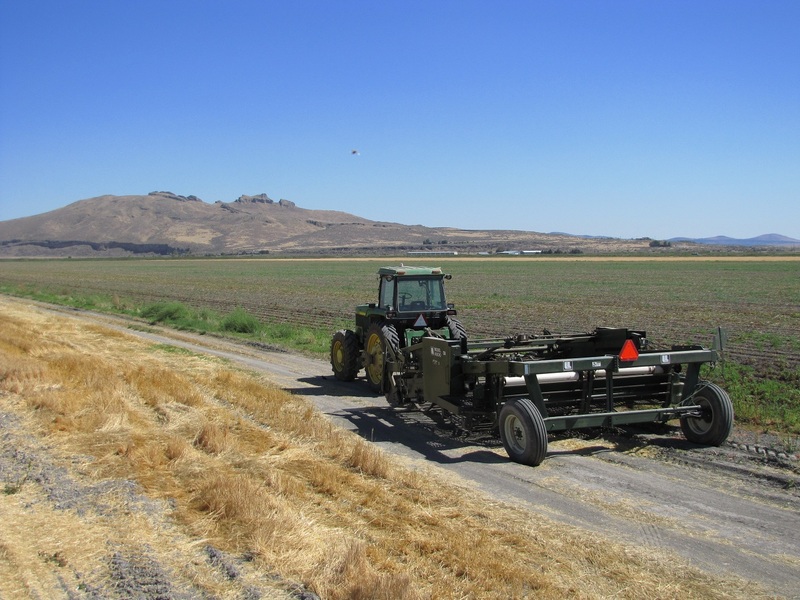 With our grain, hay and potato fields all over the Klamath Basin, it’s a dance of moving equipment and trucks over the same highways and roads the public uses. Not to mention you’re always keeping an eye warily on the weather to see when, and some days if, the crews will get to dig. This year, for the most part, the weather was beautiful for digging potatoes. With very little precipitation, the warm, sunny days made you remember why Klamath Falls is called the Sunshine City of Oregon. The scant bit of rain we did receive barely slowed down potato harvest and helped knock the dust out of the air (not to mention perk up the hay crops all over the Basin!). While we’ve built a reputation for providing high quality chipping potatoes, this year we also had a few fields planted with organic potatoes and seed potatoes. The organic red and fingerling potatoes turned out beautifully, just like our chipping potatoes did. 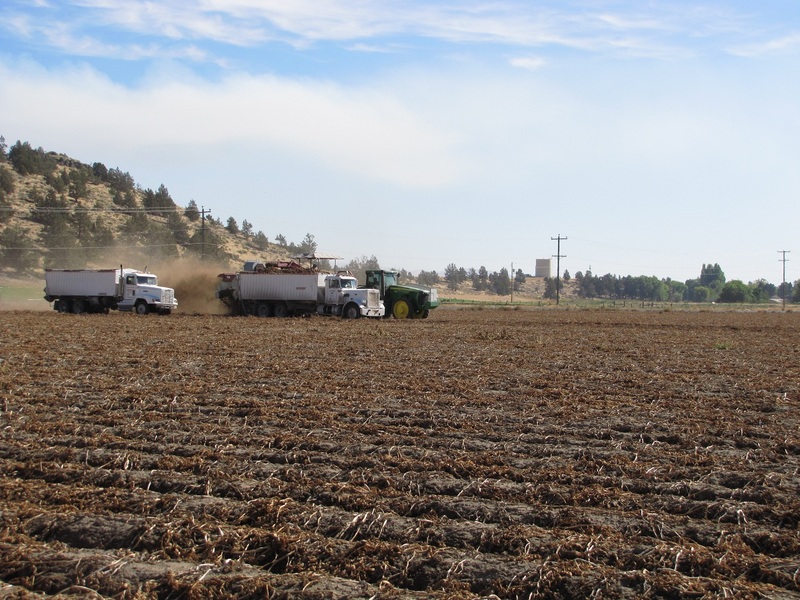 The last field we dug was seed potatoes, and while the constant sterilization of equipment made the last days of harvest drag on, Monday, October 13 saw it all come to an end. And yes, the potato seed looks great too! 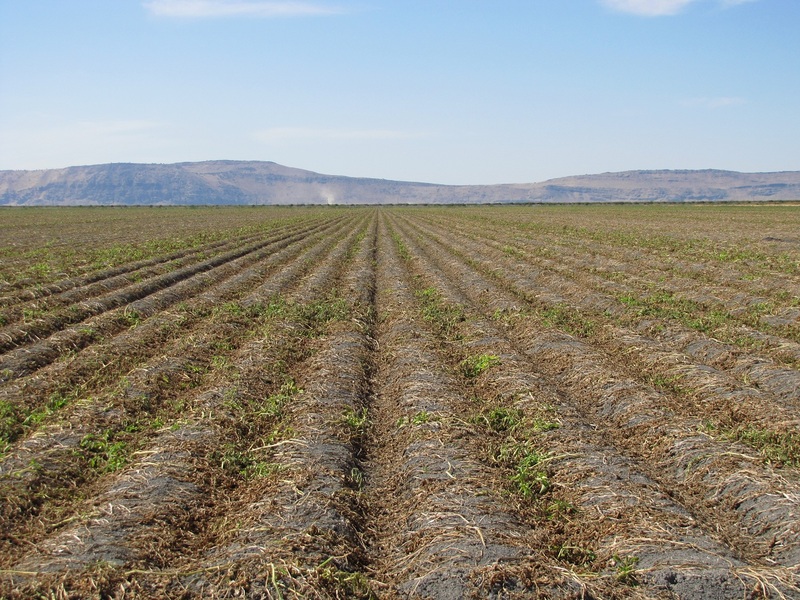 To put our harvest season into perspective, from August through October, we were cutting around 5,000 acres of grain and approximately 1,600 acres of 4th cutting alfalfa hay while digging about 2,300 acres of potatoes. Some days all three crops were being harvested though towards the end we were only digging potatoes. But as you can see, it takes a large, dedicated crew to make sure our crops are cut, dug and put into storage. 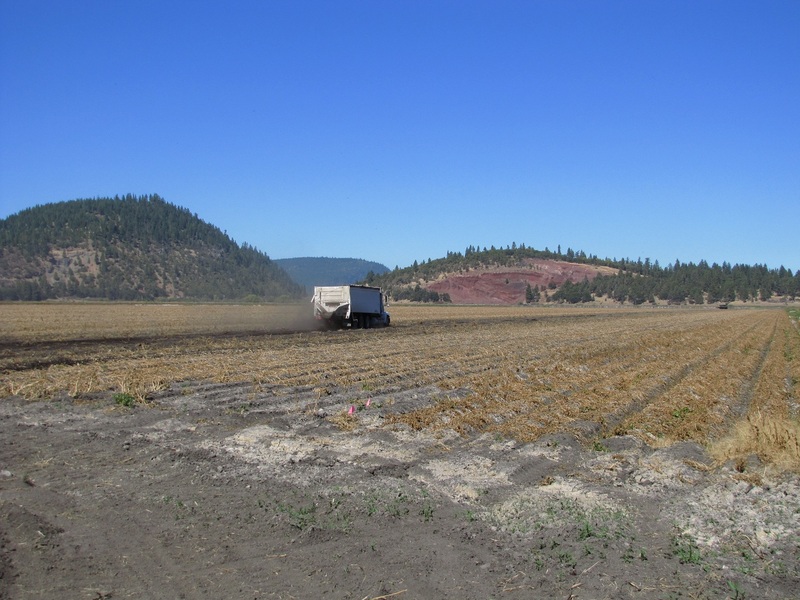 The photos below are from the last chipping potato field we harvested on October 9th, known around Gold Dust and Walker Brothers as “The Elk Field” on the Running Y. How’d it get that name? Earlier in the year, you could see where the elk were coming down from the trees on the hillside to eat a few spuds, wallow in the tilled up dirt and make trails through the field to neighboring hay and grain fields. Who says wildlife doesn’t like farming? It takes a lot of spud trucks to keep three potato bulkers going! Let the day’s digging commence! That spud truck is almost full! This could almost be a scene from the Dukes of Hazzard! Some of the loads are for storage . . .
Before we wrap up this post, John, Bill, Weston and Tricia would like to thank everyone who worked with us through harvest. It’s takes a lot of people to not only get the crops into storage, but to keep the crews moving, the spuds going to customers and everyone getting paid. Whether you work in the office, on the packing shed floor, out in the fields, on the storage shed lines, in the spud trucks, in the potato bulkers or are the managers that make it happen, thank you very much. 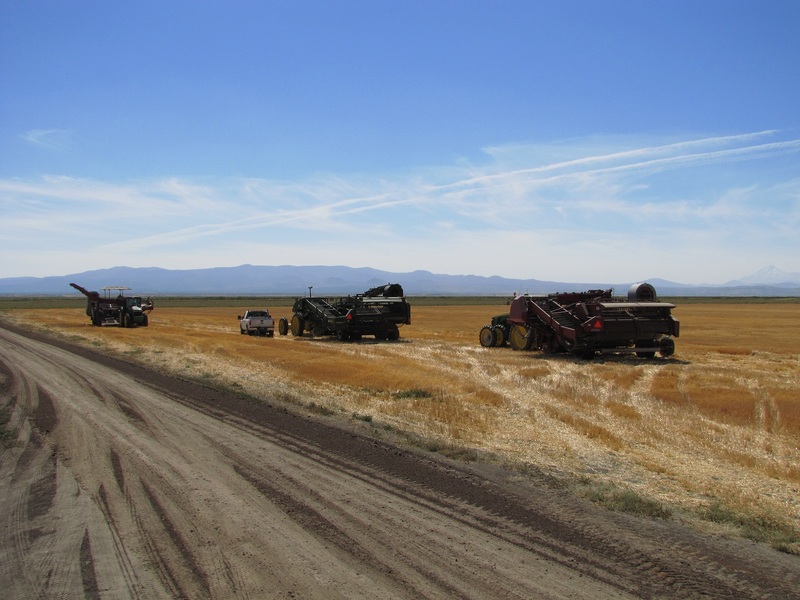 It’s been another successful harvest, and we know we can’t do it without having the best crews in the Klamath Basin. Thank you. Summer is over. 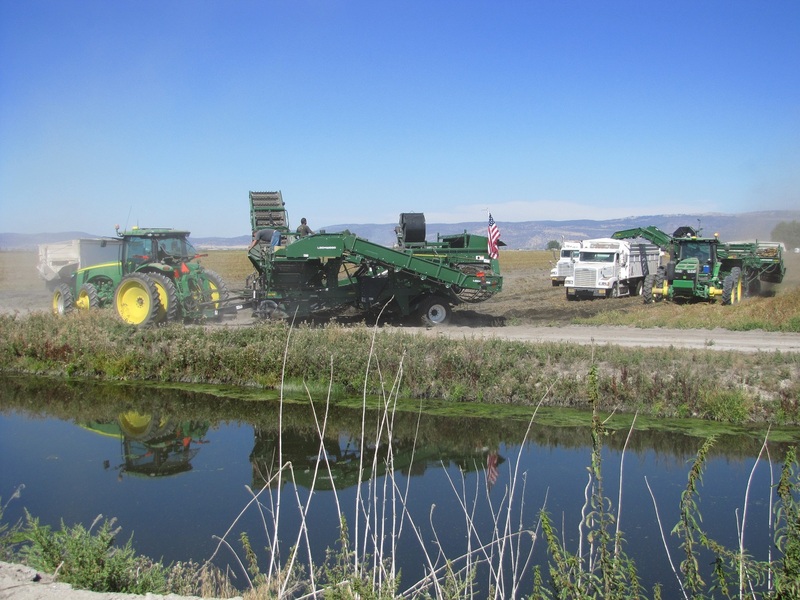 While the roads fill with school buses, around the Klamath Basin they also fill with farm equipment. The school yards fill with kids at recess while the fields fill with farm crews, swathers, bailers, combines and bulkers. The warm days, green leaves clinging to the trees and calendar might say we’re all still in summer. However, if you ask any kid what time of year it is, they’ll likely reply it’s fall. And if a farmer doesn’t say it’s autumn, they’ll tell you it’s harvest time! 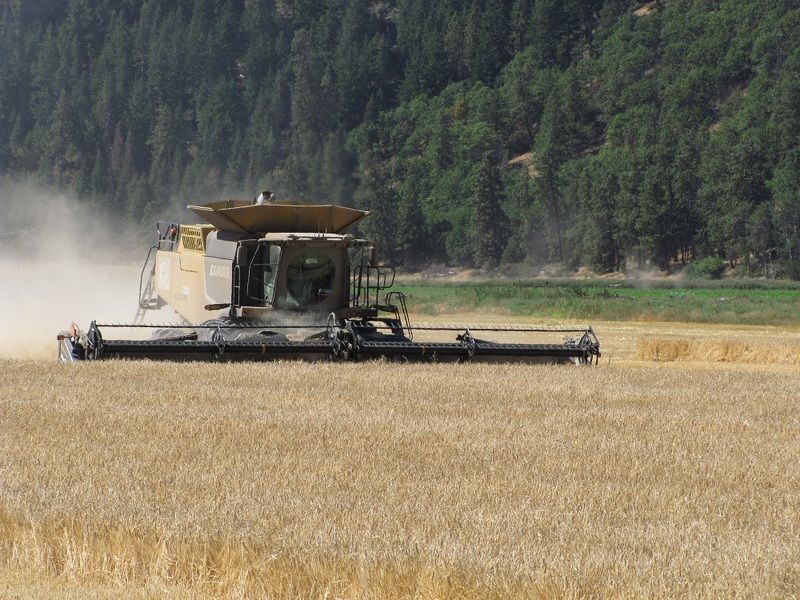 Walker Brothers started harvesting grain in the beginning of August. Despite the smoky skies all summer long and the drought, the yields have been good. The only real obstacle to wrapping up grain cutting has been waiting for a few fields to finish ripening. So far our crews have been doing an excellent job of getting the grain cut and into storage, making it as streamlined a process as possible. Ohhhh, the Walker Brothers Claas Lexion is pulling ahead! Gotta’ love seeing a combine at work! And in turn, our grain carts fills our grain trucks! On Monday of last week (September 8th), as grain harvest worked nearer towards ending, the first official day of potato harvest began. Due to the nature of chipping potatoes, we often have some of the first potato bulkers in the field. This year, along with the chippers, we’re also harvesting some beautiful organic table potatoes. Again, despite the drought, our spuds are looking pretty good so far and with a week under our belt things are going smoothly in the field and at our storage sheds! And as of the publishing of this post, we’re already a third of the way done. And that’s how you harvest chipping potatoes! As if we didn’t have enough going on, if you listen closely, you can hear our potato processing plant running. 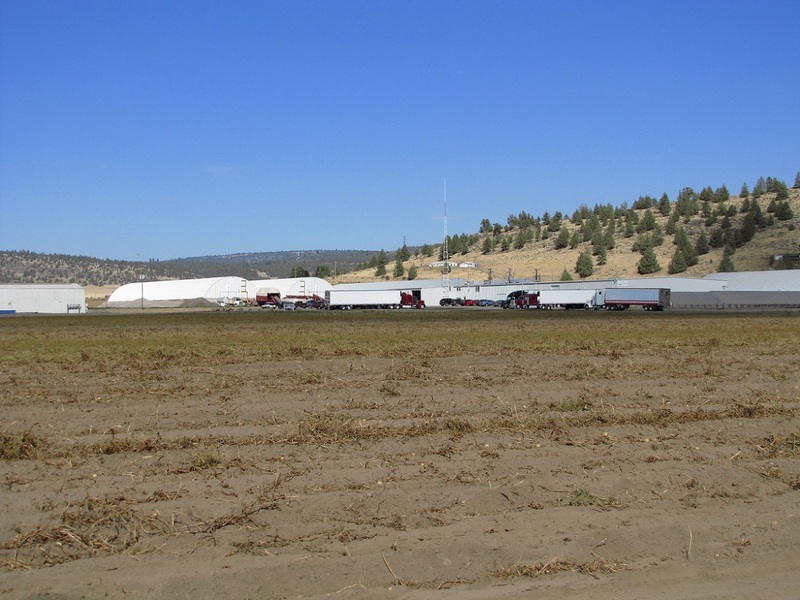 Semis with refrigerated trailers are idling outside, waiting for the crews to get potatoes loaded. While it’s not running at full tilt just yet, the number of loads being shipped and the number of hours our shed crew will only increase from here on out. And if you ask the office staff, one look at payroll will tell you we’re busy! It looks fairly calm outside our packing shed . . .
Now THAT is a big sack of spuds! Did we forget to mention we’re getting our fourth cutting of alfalfa wrapped up as well as get our straw put away? Even though harvest is one of our busiest times of year, it doesn’t mean there isn’t a little time for fun. 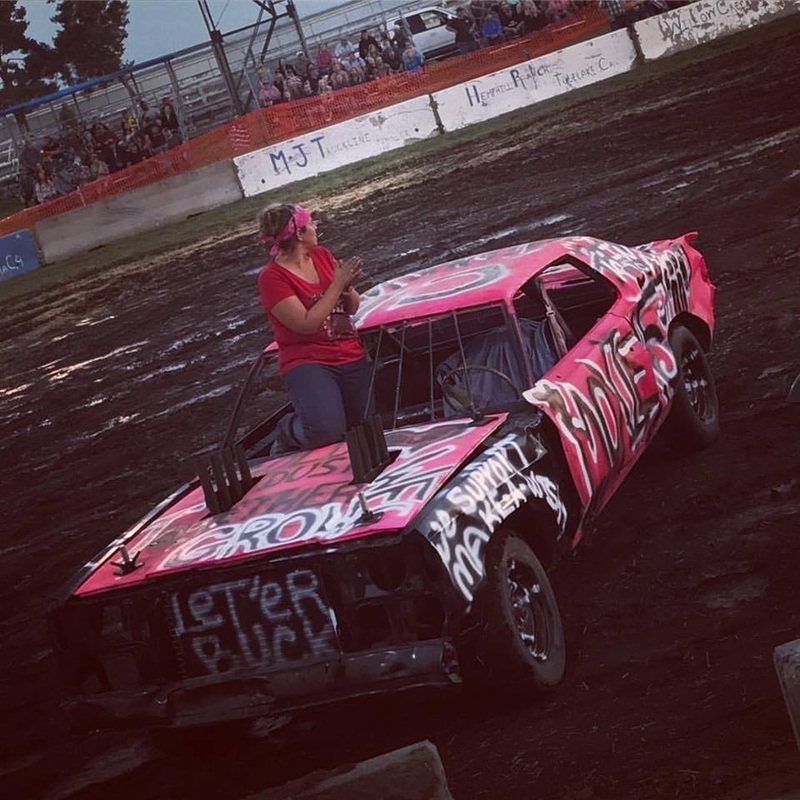 This year at the Tulelake Butte Valley Fair, some of our employees competed in the Hay Squeeze driving contest and the demolition derby. Operating our trademark white with a red stripe squeeze was Toby Turner. Though Toby mostly handles big bales, he did an excellent job managing the small bales and managed to earn 7th place. In the demolition derby, the white and red theme was carried on to a beat up Lincoln that our farm mechanics, Don Sconce, Mark Smith and Tristen Wilson put together. Don thrashed around the infield in the white and red beast, taking home 4th place. Well done, gentlemen! Ain’t that derby car a beauty? And this is what 4th place looks like. Good job, Don, Mark and Tristen! As we’ve said in past posts about potato harvest, every year is a different adventure and this year will be another. With any luck, it will end as smoothly as it’s started and everyone will finish safely and sanely. Good luck to our crews in the fields, in the sheds and in the offices – and thank you for your hard work and dedication during one of our busiest times of year! And a special thank you to Katie Walker and Lexi Crawford for the additional photos of the Tulelake Fair! Thanks, ladies! Speaking Of The Potato Festival . . . The sun was out, the breeze was slight and the weather was warm. While spud trucks traveled from the yard to the fields and then to the cellars, in Merrill a parade was getting underway. After all, it was the perfect Saturday for a parade, and a perfect day for the 76th Annual Klamath Basin Potato Festival. Held every year in Merrill, the Spud Festival (as it’s called locally) hosts folks from all over to show their appreciation for all things potato and celebrate agriculture. With booths, a potato feed, all sorts of events and the parade, there’s a little something for everyone the whole weekend. This year, the festivities kicked off on Friday, October 18th and went through the weekend. If you’ve been an avid follower of our farm blog, then you know how important the Gold Dust office staff takes the parade. After missing last year’s parade, the office crew wasn’t going to skip this year as well. 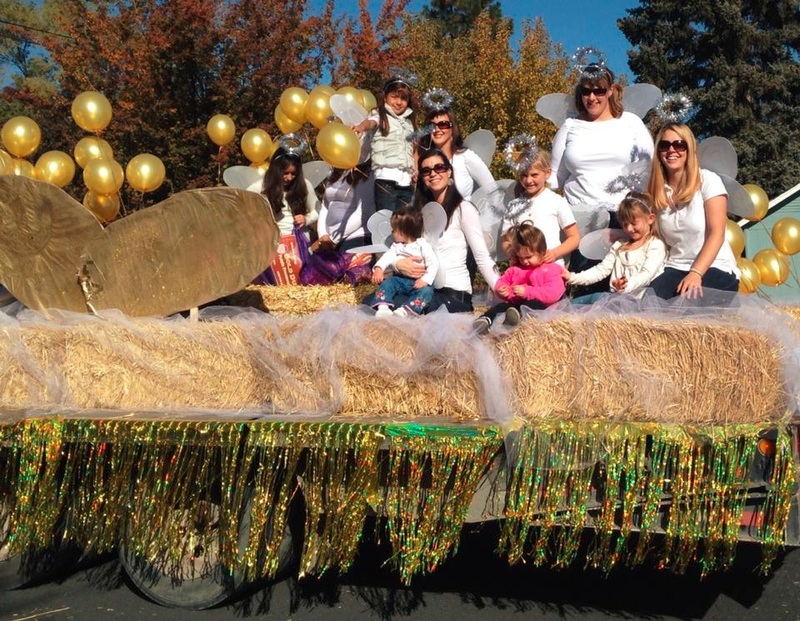 The theme for the Potato Festival was “God made a farmer, farmer grows potatoes, potatoes support our community”, so the ladies decorated a float with golden potatoes and gold fringe and balloons while they and their children donned white T-shirts and angel wings. Though Gold Dust hasn’t won an award for the office staff’s creativity yet, it’s still fun and a great way for our employees to get out in the community. But this year was different. Rumor had it that Gold Dust’s float actually did well this year! How well? We took first place in the Commercial Division and for Best Overall Use Of Theme we grabbed second. Well done, office crew! While it may appear our office staff had a whole lot of fun putting this float together, let’s not forget they made Gold Dust look good for the parade while still doing their everyday tasks. And on top of it, they all got up early on Saturday to put the finishing touches on the float and to participate in the parade, not to mention get their kids around to help out too. So ladies, thank you very much for your hard work on the float and congratulations on getting first place! And before we wrap up this post, Gold Dust would like to thank the folks who put on the Potato Festival. It takes a lot of hard work to put together an event like this, and it’s great to see people putting in the time to not only make it a fun event, but one that celebrates out local ag community and continues to grow. Thank you. Looks like Sarah’s taking one for the team! Now THAT is a Spud Festival float! Well done! Our potato fields are littered with the remnants of dead potato plants and chippers that didn’t make it through the bulker. Tracks from our diggers and spud trucks have replaced the long rows of plants. The bulkers and tractors are quiet, while the spud trucks have changed duties from hauling chipping potatoes from the fields to storage to hauling them from storage to the packing shed. On Monday (October 15th), just before lunch, our last field was dug. This year potato harvest lasted a little over a month, and considering the ground our harvest crews covered, it’s a pretty amazing feat. 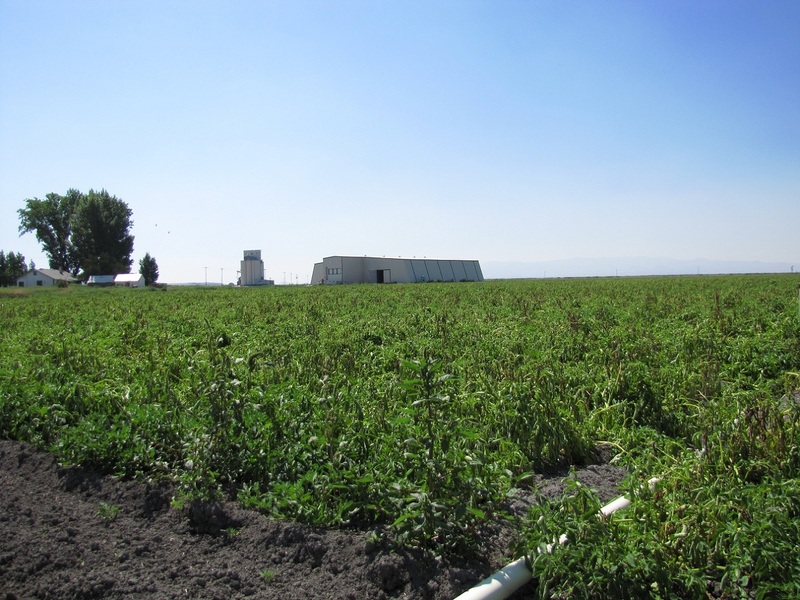 We had spuds in fields we traditionally farm in the Leases as well as around Tulelake, Malin and Merrill. 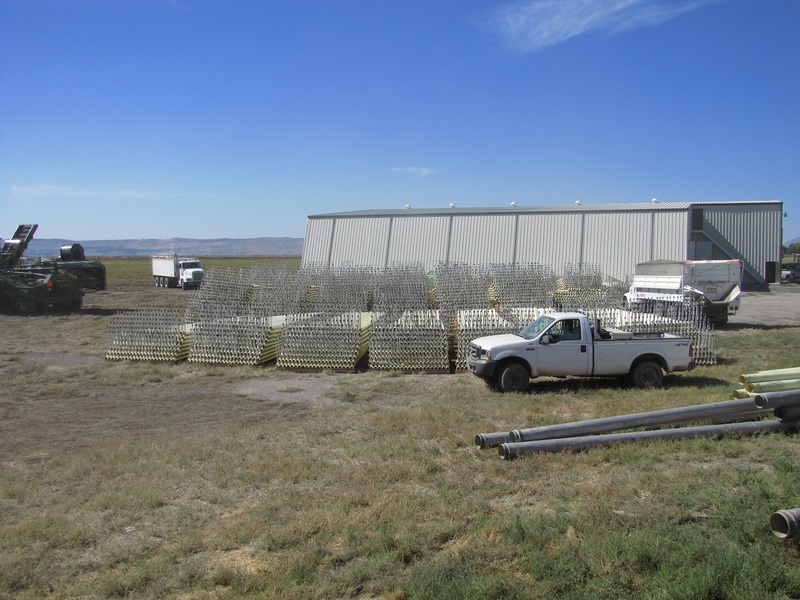 However, this year we also farmed the Running Y Ranch, which didn’t add much to the acres we had to harvest, but it did add to the miles our equipment and crews had to cover. And now that it’s all said and done, this year we had a beautiful crop with impressive yields. So, how did we get through harvest so quickly? To start with, we have a hard-working, experienced, dedicated crew who stepped up and put in the hours to make it happen. From the guys on the bulkers to the folks in the spud trucks to everyone at the storage sheds, packing shed and in the office, every person worked hard to make potato harvest go as smoothly as possible. We also had beautiful weather which allowed us to start on time every day and not wait for the day to warm up, or cool down, or the soil to dry out. It’s been a beautiful fall for digging spuds! Finally, we’ve been doing this for quite a while now. Though every harvest is different and presents new challenges nobody could foresee, we’ve developed a knack for growing and harvesting chipping potatoes. 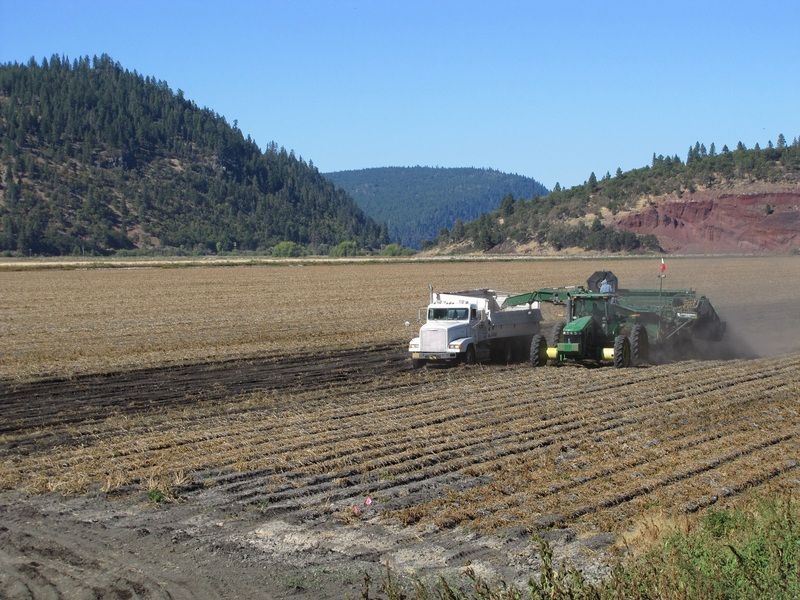 Before we get to some final pictures of potato harvest on the Running Y Ranch and around the Malin area, John, Bill, Weston and Tricia would like to thank the crews and staff for making this another successful potato harvest. Everyone’s hard work is appreciated, and there is no crew around that’s better than the one that works for Gold Dust and Walker Brothers. Thank you, everyone. All of you helped make this a success. Now, for some final potato harvest pictures! 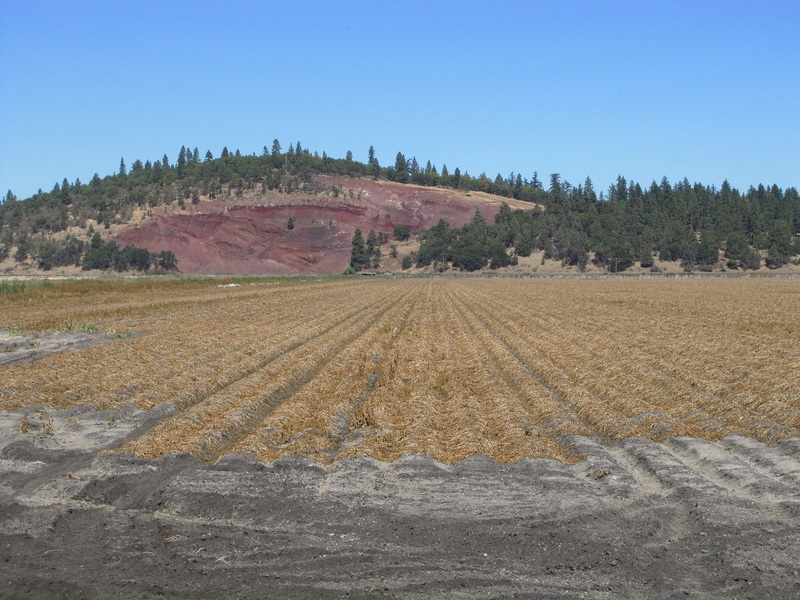 And enjoy the Klamath Basin Potato Festival! And the same field at the beginning of October – what a difference a month and a half makes! Many of our spud truck drivers are reformed drag racers. Just kidding, Mr. Insurance Agent! Now THAT is a beautiful chipping potato! Mt. Shasta, Old Glory and a potato bulker – what a beautiful sight! Another beautiful day to harvest chipping potatoes! After a year of new ground, stuck tractors and all the other drama that comes with farming, our potato bulkers are in the fields digging chipping potatoes. 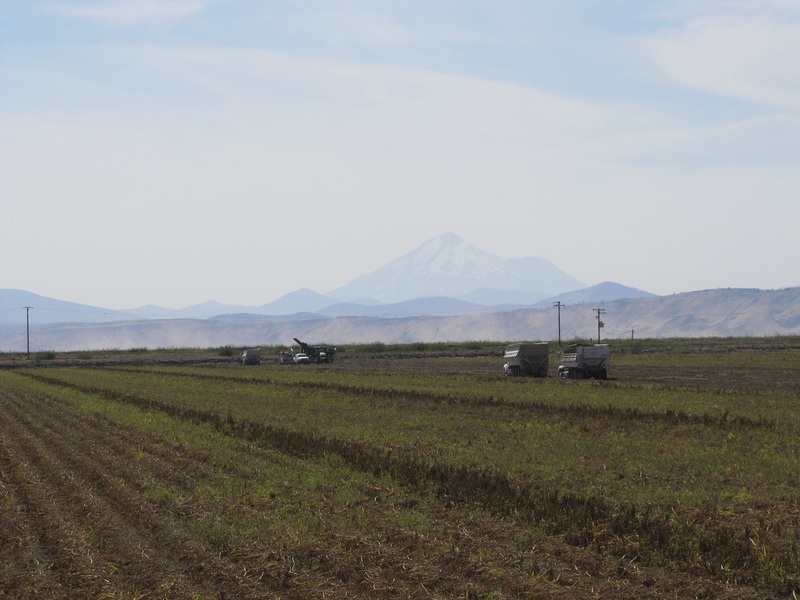 It’s official – potato harvest has began! 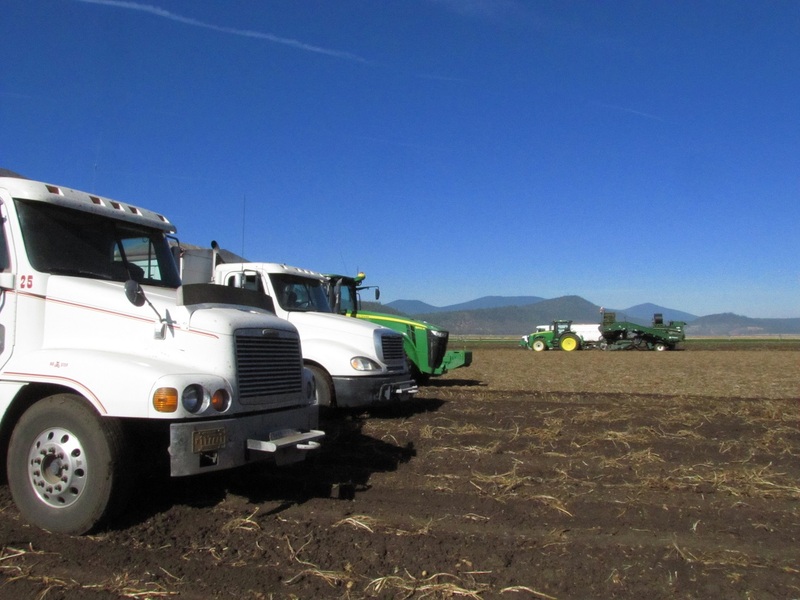 On Thursday, September 13th, we headed to the leases with our bulkers, tractors and spud trucks. Though we started digging the on the 13th, we’ve been preparing for potato harvest for weeks. Before the diggers can be pulled into the fields, they need to be prepped for the long hours ahead while the pipe crews pull solid set from the potato fields. 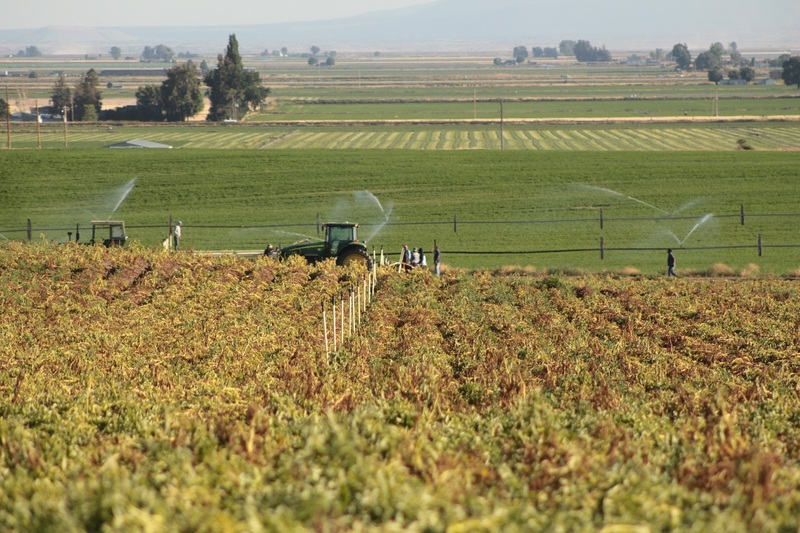 Rollers are dragged over the rows to kill the potato plants and the vines that have grown between the rows are cut. Then, after all that prep work has been done, we can get the chippers out of the ground. Every growing season is different and challenging, and this one was no different. 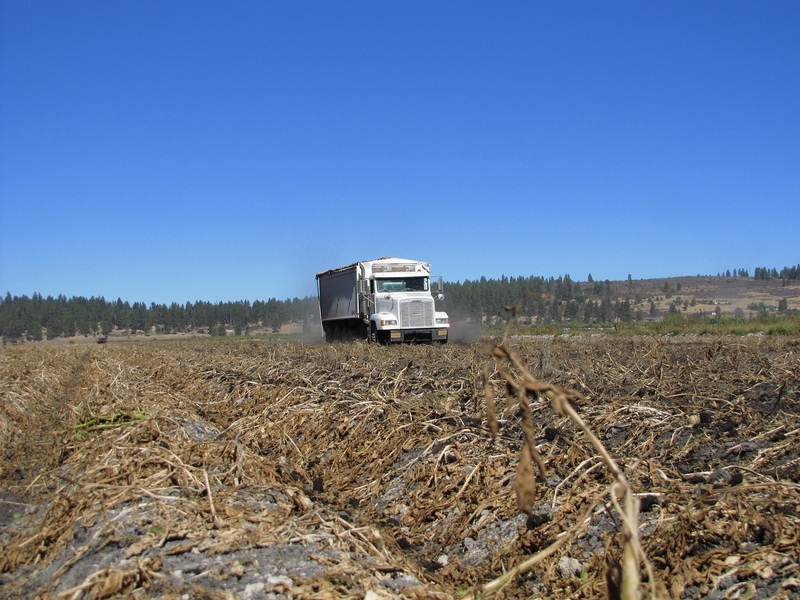 The threat of drought weighed heavy on the minds of farmers all over the Klamath Basin throughout the winter and early spring while fires from Northern California and Eastern Oregon filled the late summer skies with heavy smoke, leaving some to wonder if it would have a negative impact on the growth of crops throughout the area. However, looking at the potato plants and evaluating the chipping potatoes themselves everything looks good! Though we’ve cranked up our diggers to get the chipping potatoes out of the fields, the combines are still cutting grain for harvest and the third cutting of conventional and organic alfalfa hay is meeting the swathers and bailers. It’s certainly a busy time of year for our farm crews, and we hope that everyone works as safely as they do hard. So, before we get to a few pictures, let’s all hope for a safe and successful potato harvest. Thank you to our hard working crews for the long hours you’re putting in. Let’s have a great harvest! 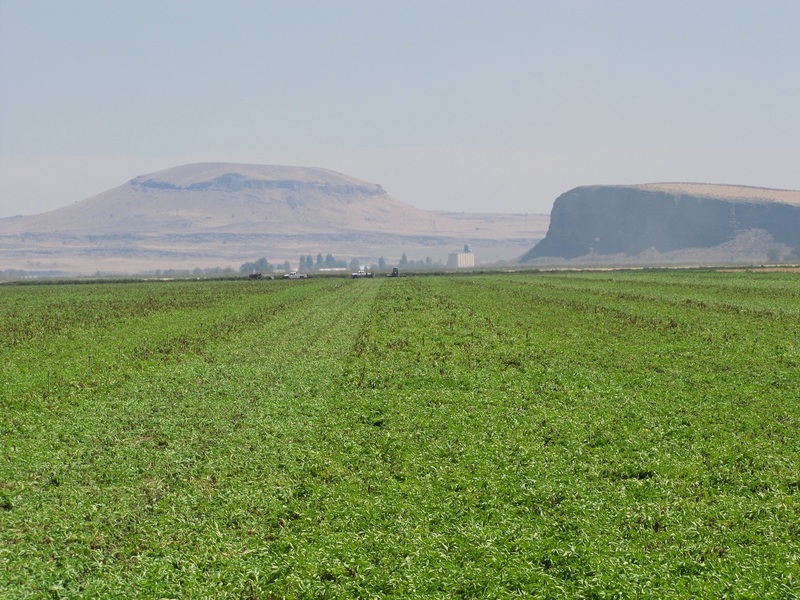 Below are photos taken of the Stronghold Field and other leases we have on the Tule Lake Wildlife Refuge. Photos from before potato harvest were taken on August 31st, two weeks before the potatoes were dug (September 14th). 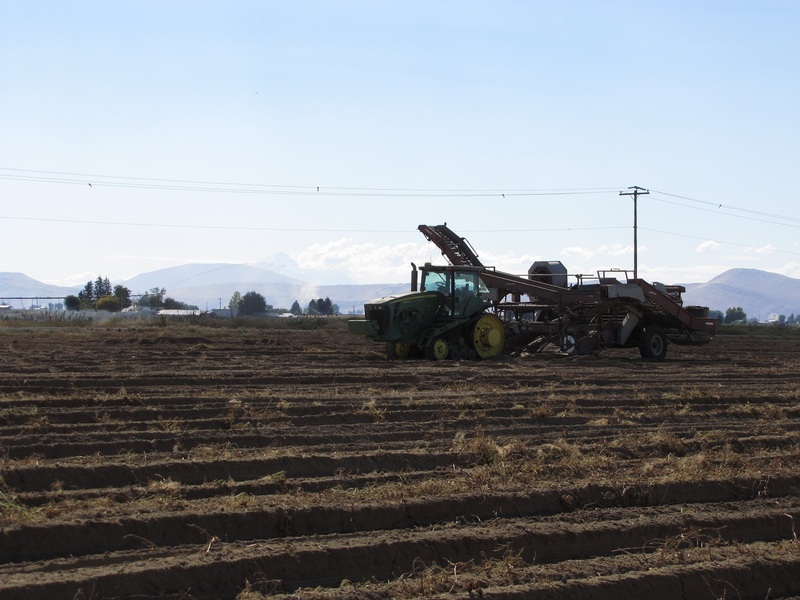 In these images you can get a small glimpse of what we do to prepare for potato harvest, and then of those same chipping potatoes being harvested. Enjoy! 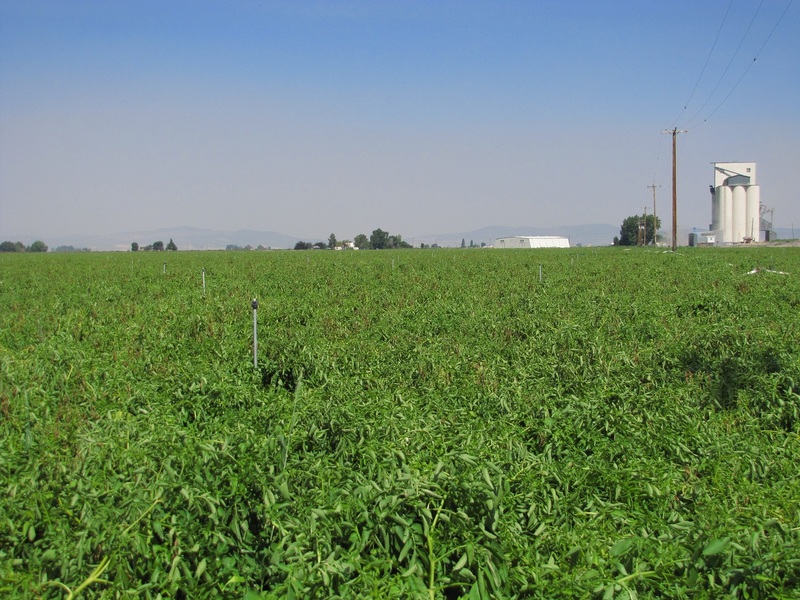 Despite the smoky skies, this potato field looks pretty good! Not to brag, but that really is a good looking potato field! 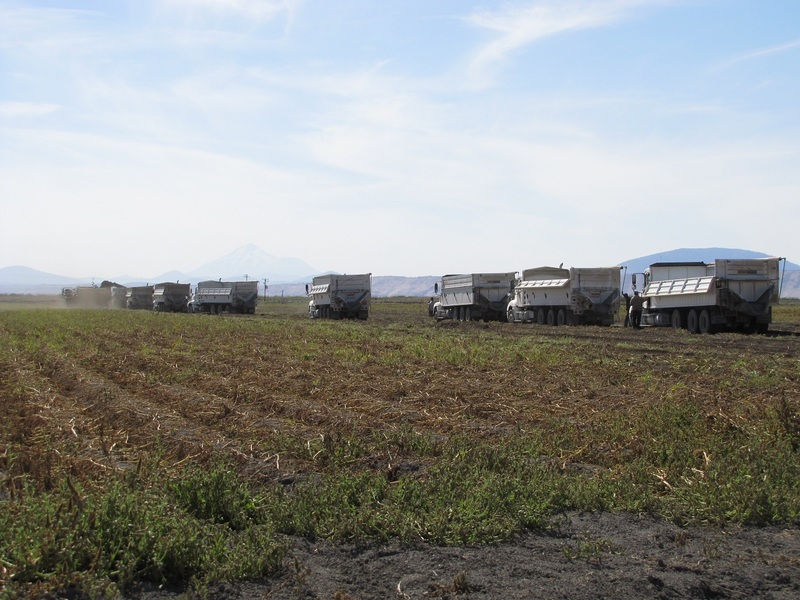 Again, it takes a lot of coordination to run that many spud trucks in one field! And this isn’t all the potato trucks in that spud field! Don’t worry, fellas – your turn is coming soon!